Since the majority of games (or, perhaps it is better to say, pretty much every major game out there) relies almost entirely on pre-scripted advancement techniques to handle plots and narratives, I figured I’d write a little article on choice paths in games. Choice paths are something that I used a ton when I was working on Orchestra over on Story Nexus, and they’re a great way to see what you’re doing. The simplest choice path is linear. 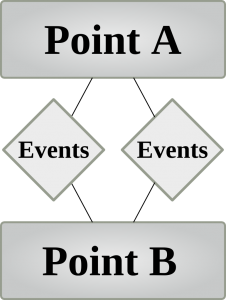 In a linear path you simply move from point A to point B along a straight path of choices. This is the easiest “choice” to implement as a game designer, as it requires the least content or effort, and tends not to generate state divergence that can endanger valued outcomes (i.e. there’s no chance for players to do unexpected things and induce an error). As one of the more traditional methods, there are countless examples of this simple linear approach to game design. 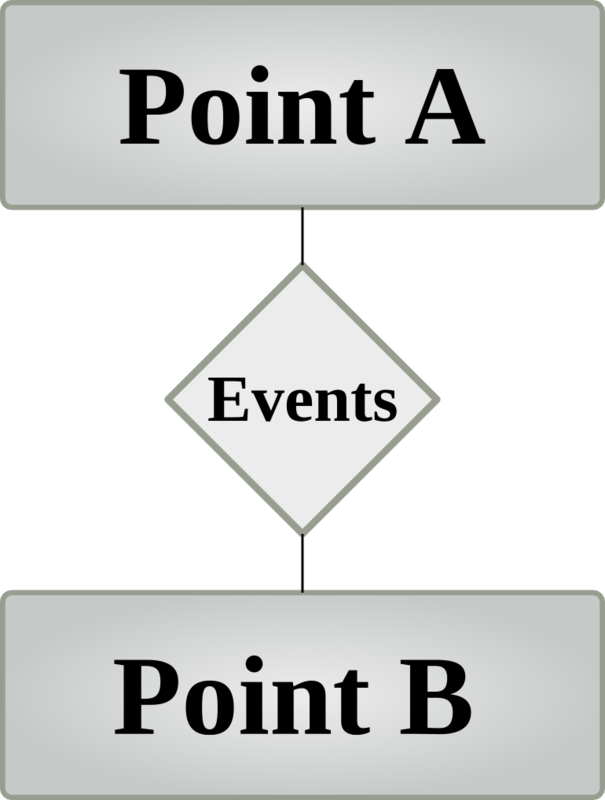 The linear approach is strongest when a game carries its own weight with strictly game engagement elements, whether they come in the form of the intellectual challenge of puzzles or strategy games or if they take the form of skill-based action play; in less complex games linear paths can become boring quickly. Linear paths tend to be somewhat usurped by the more advanced Option Paths in almost anything advanced. 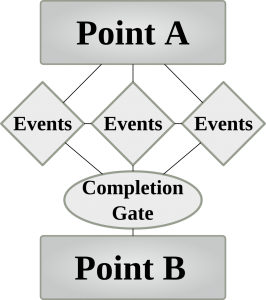 Option paths have been around for a long time; secret areas in many classic games are the progenitors of more complex modern option paths. Option paths give versatility, and give some degree of challenge or special reward to players who are willing to branch out and explore. 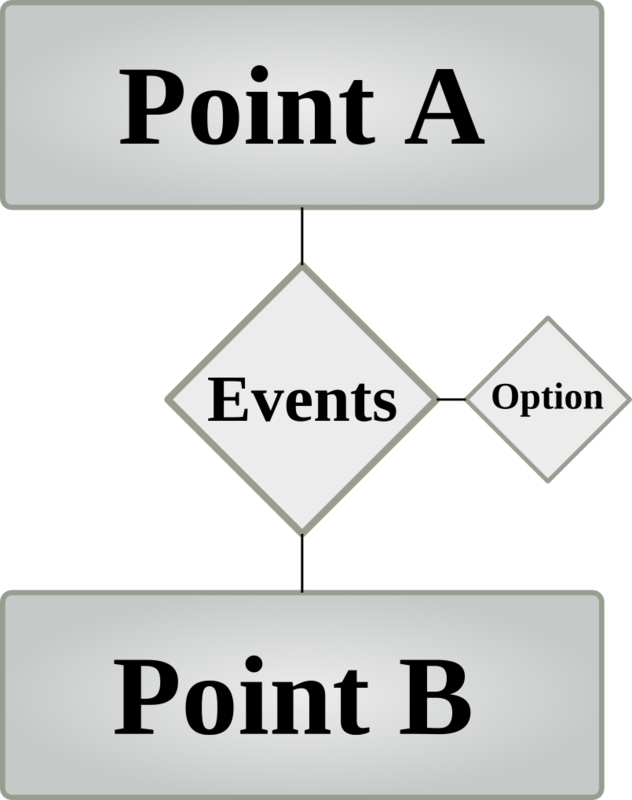 The defining characteristics of an option path, as opposed to a divergent path, become clear when players observe what content they experience; an option path may actually be desirable because it allows players to experience all the content before and after the option offshoot, regardless of whether or not they take it. Another common game design trend is the divergent path model. Much like an option path, there are entirely different paths leading from A to B. For instance, players could choose to go either through the forest or the plains. 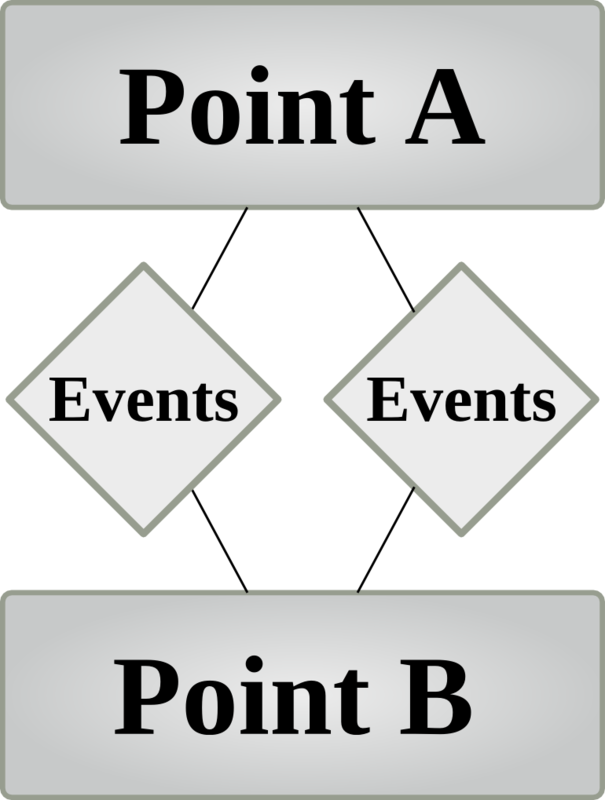 The downside of this system is that content is “missed”; unlike an option path players can only experience one outcome, at least within a single run of the content, so both must be fully self-contained experiences complete with the drain on resources and time that creating such content comes with. 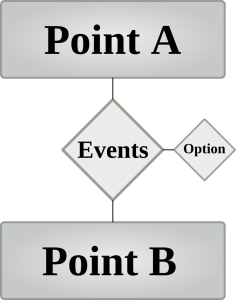 Fortunately, divergent paths do add replayability to a game, and if the differences are meaningful and immediately apparent players can choose their preferred method of doing things. Divergent paths are very expensive and difficult to create, but offer great flexibility. Finally, there are dinner paths. These play with the three simpler forms of paths by introducing a sense of false nonlinear progression; rather than having a direct progression from A to B with stops in-between, dinner paths have a variety of different elements that can be completed in any order. For instance, Shadowrun Returns’ Dragonfall expansion includes a variety of runs required to raise funds for a storyline-crucial purchase. Dinner paths do not have to be exclusive and responsive; it’s possible to jump between the “courses” that make up the paths or tightly restrict players to one or another at a time or to integrate feedback from one “course” into the other parts. Dinner paths can be hard to do well because they can have difficulty curves and spikes; unless some balancing method is used they will likely run into issues with difficulty when the player is given an option to experience content with various degrees of personal and in-character efficacy. When done well, however, a dinner path allows players to feel less forced along a path and allow them some real options in the way they play. Dinner paths are unique in the more simple choice paths in that they have not only the core events for each path but also a completion gate; at least a few of the options must be completed before the player can advance, which sets them apart from a divergent path in which there are fewer options. 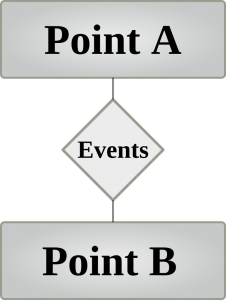 In addition, players are typically free to move between the different core events; they may have to finish up a whole chain before moving on to another but the important thing is that each player will see all or most of the content, which minimizes content creation and concerns with players and game states being in the right place to move on. While difficulty shifts and accidental errors can quickly spell disaster for a dinner path, they allow a player to digest all the content in a manner they choose, rather than being forced along a specific plot and into a particular environment. One thing to note is that a game can use multiple different forms of paths as it goes through its content. Dungeon Siege, for instance, is a somewhat classic hack-and-slash game (that I may have an unnatural fondness for), but spices up its otherwise linear game-play with the occasional side-area for the observant or curious. If you look at narrative, most games are highly linear; only a few games have divergent storylines in the mass market and it’s rare to see a truly procedural plot (which we’ll touch on in plot 2) in even the most minimally complex games.